Earth Day 2019 is fast approaching! We think Earth Day is a great time to rally people to do something impactful for their community. The University of Denver Center for Sustainability, Center for Community Engagement and Service Learning, and the Metro Denver Nature Alliance have paired up to create an awesome opportunity to do just this - and we want your help! Sign up below to volunteer with any of our amazing community partners to make a real difference in our city this Earth Day!! Join us for a kick-off breakfast where you will receive your t-shirt, meet up with you project Team Captain, and get stoked for the day - 9AM on Carnegie Green. After a day of hard work, join us for a casual come-and-go happy hour at Kaos Pizzaria from 3-6PM. In order to get the DU Community Garden ready for planting season, we need help with mulching, weeding, and other projects. Wear clothes that you don't mind getting dirty! I can be there from 10-noon. I can be there from 10 to noon. Westwood Unidos empowers the residents of the Westwood neighborhood to revitalize their community. We will be doing a cleanup in some alleyways, fixing a public mural, and prepping a community garden. Transportation to the site is provided. SAME Cafe is a pay-what-you-can cafe in Cap Hill dedicated to making fresh, healthy food accessible to all. Help SAME build out their community garden and get ready for planting. Located at 18th and Humboldt, we'll help coordinate transit to the site! I will be there 10:00-11:30. Get the Denver Green School Community Farm ready for growing season and summer classes with our friends at Sprout City Farms. We will help to coordinate transportation to the project site, located in the Washington Virginia Vale neighborhood. Get your hands dirty and help us get our newest campus garden ready for the growing season! Located at the English Learning Center at Josephine and Asbury. Please wear clothes that you don't mind getting a little dirty! I have a meeting from 10-11, but can be there 11-2. Due to a meeting I will be available starting at 11am. GrowHaus is a local non-profit dedicated to making fresh, healthy food more accessible in the Elyria-Swanzea neighborhood of Denver. Help us put together food boxes to be delivered to people all around the city! We will help coordinate transportation. Jovial Concepts works to turn boring lawns into fruitful gardens throughout the city. Come help build new gardens and get existing ones ready for growing season! Project site is in the Barnum neighborhood, we will provide transportation to the site. Do you love to get your hands dirty? Work with little kids? Help the Fisher Center at DU create 3 new garden beds in their playground area and help teach the little kids about gardening and fresh food. Re:Vision Denver is run by two DU alums focused on providing economic opportunity and local food to the Westwood neighborhood of Denver. Come work in the gardens to get them prepped for growing season! Transportation to the project site is provided. GRID Alternatives is a national leader in helping low-income neighborhoods gain access to clean, renewable energy. Help them install a solar array and learn about the benefits of solar. We will help coordinate transit to the project site. I get out of class at 9:50 so may be a little late. 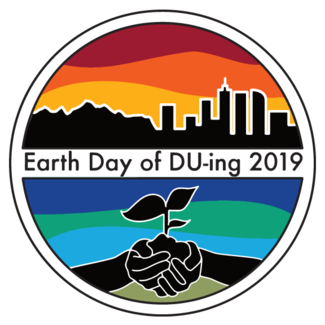 Want to get your hands dirty and help reduce waste at DU? Help us conduct a waste audit of several buildings so we can better understand how to make recycling and composting easier. No need to travel - we'll be working right here on campus! I can be there from 10 to 12! Help us expand the Bridge Community Garden to include a permaculture space for exciting new gardening opportunities! Wear clothes you don't mind getting dirty. Come help clean the Harvard Gulch Trail just south of the DU campus with our friends at Destination Collection and Denver Parks and Rec. We will be working to ensure the trail remains a great way to get around our part of town on bike or foot. Not sure if I can stay for the full four hours, but I'll attend for as much I can! Work with the elementary students to understand recycling, composting, and waste. Spend some time sorting waste with the students and marvel at how adorable they all are! This location is bikeable from the DU campus.